Last weekend, I successfully paced my buddy Ed Roberson to the finish line of the San Juan Solstice 50 Mile Run in Lake City, Colorado. Make no mistake. He’s the one that made it happen. He’s the one that took off down a sleepy mountain town’s main street at 5 a.m. and didn’t stop until nearly 16 hours later. He’s the one that climbed higher than 13,000 feet on that journey. The one that crossed freezing mountain streams up to his knees; ran while inhaling smoke from nearby wildfires; and overcame heat exhaustion at the 42-mile mark. I’m just the one who tagged along for the final 10 miles to make sure he didn’t wander off alone into the woods. Superlatives aside, my experience qualifies me to offer some advice for anyone preparing for their first time pacing an ultra runner. These tips may be especially helpful if you (like I was) are nervous about what lies ahead of you. If understandable if you’re a little nervous. I was concerned about running at altitude. But the more I thought about it, I realized I’d be fine. Ed was going to run 50 miles. And he was asking me to run/hike/walk the final 10 measly miles. So unless your runner is asking him or her to pace him for a distance you’ve never run before, relax. By the time your runner makes it to you, he or she will probably be so tired that you might be setting off for a vigorous hike. Not a run. 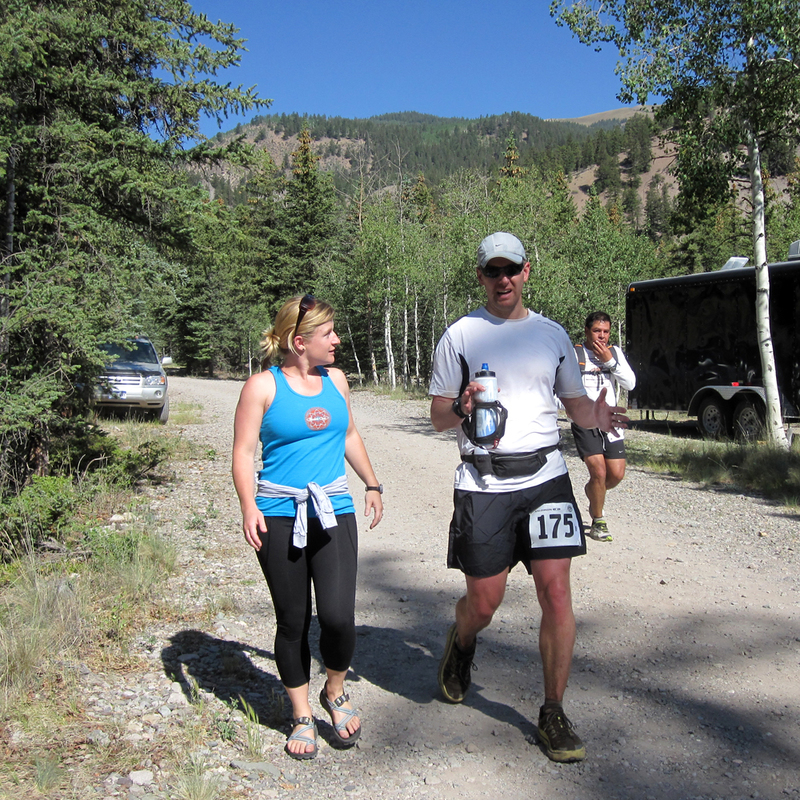 Ed Roberson runs into the second aid station, with his wife, Kim, at his side. 2. Remember that this isn’t your race. Forget about yourself for a few hours. That’s not to say you shouldn’t stay hydrated, replace electrolytes, and keep yourself out of danger on the run. But when you’re pacing, the race isn’t about you. It’s all about your runner. Your only mission is to make sure your runner is OK. So maybe choose another time to talk about that hangnail that’s been bugging you all afternoon. Your runner is probably dealing with much worse. 3. Read/watch/listen to every pacing resource you can find. There are plenty more resources on the web, but these are a few that helped me. 4. Know what motivates your runner. Does your runner prefer casual conversation? Light-hearted banter? Funny jokes? Outright vulgarity? However, if you’ve never run more than a marathon with your runner, see the next tip. 5. Be prepared to forget that last tip. What your runner says motivates him or her before the race may not apply at mile 42. 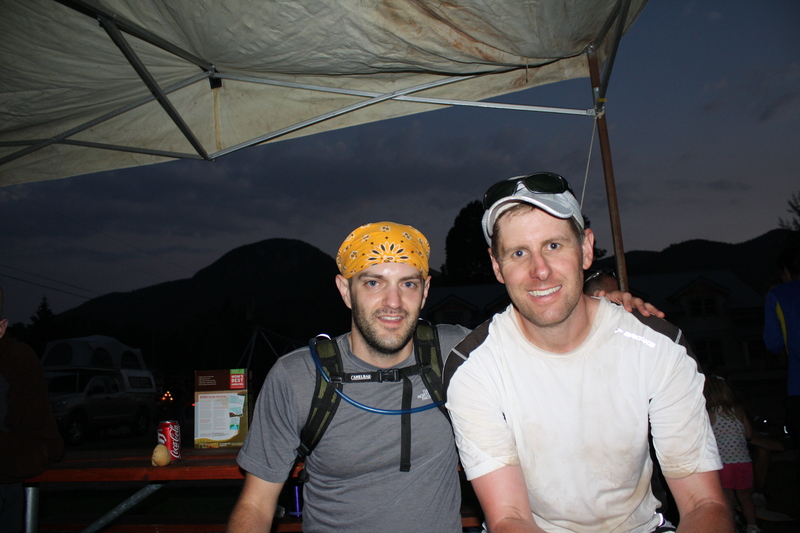 When I met Ed at the 40-mile aid station, he looked great. So great that I wondered why he needed me. 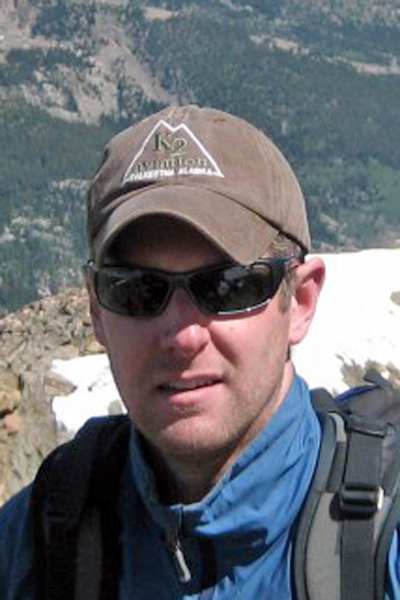 But 30 minutes later, as we began a 2,000-foot climb up a gorgeous aspen-covered trail, exhaustion crept in. For what seemed like an hour, we rested at every other fallen tree, where Ed threatened to puke each time. 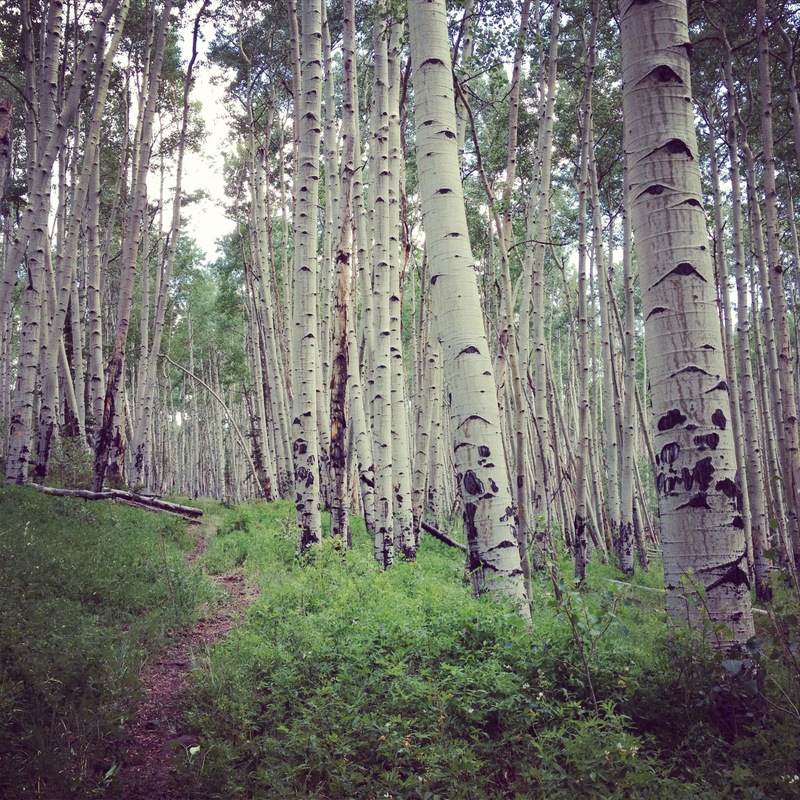 Along this stretch of aspen trees, I begged Ed to keep drinking water. But even though he’d told me beforehand that I might need to talk trash to him, I knew he needed me to urge him to drink more water and follow Tip No. 6. This is good advice for anything, but it applies to pacing, too. Your attitude is contagious, so you might as well spread some good. 7. Be a better liar than me. This quote from The Rocket (in the aforementioned podcast) stuck in my head throughout the day of the race. I tried this around the 43-mile mark when another runner asked me how far I thought it might be to the 46-mile aid station. “Probably two miles,” I said somewhat confidently. But Ed wasn’t buying it. “More like three,” he said, knowingly. 8. Know your runner’s goal and kindly help him or her stick to it. Before the race, talk to your runner about his or her expectations for the run. What’s the goal? Winning? Finishing in the middle of the pack? Or just plain finishing? You’ll definitely want to know this before the race. That may be true. But it may also be your runner’s pride kicking in. Do your best to kindly urge your runner toward the initial goal. 9. Don’t assume your job is over when your runner crosses the finish line. Did you just run an ultra marathon? No. You ran part of an ultra marathon. There’s a big difference. So keep being useful and go grab your runner something to eat and drink. Jon Page with Ed Roberson, who looks like he could run another 50 miles. 10. Get ready to catch ultra running fever. Despite nearly watching Ed cough up a packet of gel, my desire to run an ultra is now at an all-time high. I don’t know when I’ll do it. Or where. But I know I’ll do it. Back in January, a knee injury forced me to preemptively drop out of what would have been my first ultramarathon. At the time, I didn’t write too much about it because I was crushed. I feared I may never realize my dream of running an ultra. Worse yet, I worried my doctor might tell me to quit running. 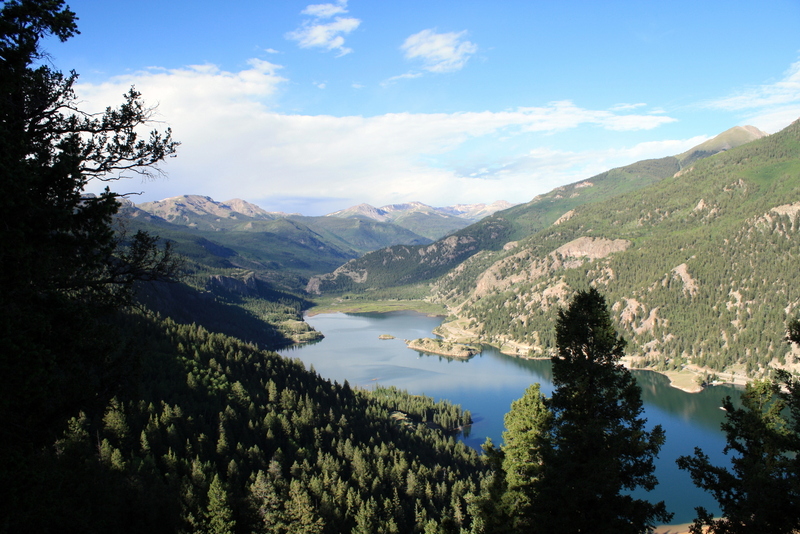 That’s why I’m happy to announce that I’ll be running an ultramarathon later this month in Colorado. I’ll be pacing my buddy Ed Roberson for the final 10 miles of the San Juan Solstice 50 Mile Run, a grueling race featuring more than 12,000 feet of climbing that tops out at 13,334 feet. Considering that my runs in Raleigh rarely reach higher than 480 feet, I will definitely be out of my element. Fortunately, those last 10 miles only have 2,000 feet of elevation gain and I won’t have to climb higher than 11,500 feet. Then again, by the time Ed makes it to the 40-mile mark, he might be walking and talking gibberish. Therefore, there’s a good chance I might have to push him up a few hills. And if that’s nearly as tough as pulling a donkey up a Colorado hill, I could be in trouble. I realize that this isn’t something just anyone can enter. But someday I will run an ultramarathon (that anyone can enter), and I see this as part of the journey towards that goal. In these final weeks leading up to the race, I’ll be looking for any and all advice I can get on the topic of pacing ultra runners. If you’ve been a pacer or had a pacer, I would love to hear from you. Especially if you have practical and/or funny advice. I’ve been living in a state of denial for the past two months. Despite a nagging knee issue (notice how I still refuse to call it an injury), I’ve kept telling myself that I’ll be able to compete in the Uwharrie Mountain Run on Feb. 4. Even though it’s a 40-mile run. Even though it’s on a hilly trail. And even though I haven’t managed to complete a single run longer than 13 miles since November. None of that mattered, of course, because I’d simply gut it out on race day. But it’s time to face the reality that I have no business running that distance through the woods in my current condition. Today, I finally e-mailed the race organizers to let them know that they should give my spot to a lucky person on their waiting list. Sure, it hurts a little to finally admit it. But it’s also a relief. During the past year, I’ve fallen in love with running for its stress-relieving, worry-zapping powers. Recently, however, I haven’t been able to run more than 5 miles without stressing and worrying that my knee won’t be able to carry me 40 miles. Now, without that fear clouding my thoughts, I’m willing to bet that this 5-mile run I’m about to take will be a breeze. In the mean time, I should probably be on the lookout for more cool stuff with less impact on my knees. Pillow fighting, anyone? This February, I’m taking a flying leap past my usual requirements of competing in offbeat, obscure, wacky, or just plain ridiculous contests. Instead, I’m entering a race that’s just plain insane. The Uwharrie Mountain Run is a 40-mile trail run billed as “a true adventure that requires intense concentration.” That’s probably because the course promises treacherous hills, ample opportunities to fall down, the potential to easily get lost in the forest, and numerous stream crossings, which depending on the weather, could be freezing cold. Of course, it could also be raining. Fortunately, I’ll probably be far too insane to care. If I’m never on a reality TV show, it won’t be for a lack of trying. At the urging of my friend and former boss Bil Boyd, I have applied to appear on the ABC show Wipeout. Yes, I have applied for the chance to look like a complete moron on national television. Don’t act like you’re surprised. Obviously, I have no idea if I’ll ever hear back from the production company. As I understand it, most of the people who wind up on shows like this were discovered at on-site casting calls in California shopping malls. Or they slept with a producer. If you could be anyone living or dead, real or fiction, who would you be and why? If you were granted one wish (however impossible), what would it be and why? In case you’re wondering, I said I can be a jerk; that I’d like to be Marty McFly so I can travel through time; and that I’d like to play a football game for the Steelers. On the moon. Why the Steelers? Because I’ve been a fan all my life. Why the moon? Because if we lose, at least I can say I’ve been to space. As clever or just plain stupid as that might sound, who knows if anyone at the production company will read my application? Either way, I’ll keep you posted. Back when I was wrapping up my first year of writing this blog, I promised you, faithful reader, that I wouldn’t stop entering wacky, senseless, and ridiculous events. Of course, I was careful to note that I wouldn’t be able to maintain my previous pace of entering at least one contest each month. Even with that footnote as an excuse, I never intended to go four weeks without writing a post—let alone four months. Call it a hiatus, a sabbatical, a spiritual retreat, or plain laziness. No matter what, I’m back, and my next event is another marathon. Even though I haven’t blogged since June, I haven’t stopped running. In fact, since the Tobacco Road Marathon in March, RunKeeper says I’ve run 568.6 miles, or about 20 miles each week. I’ve used most of that time to somewhat successfully concentrate on not falling face first on the trails at Umstead State Park. During the rest of the time, however, I’ve thought much about my next steps for this blog. Its future has mirrored the highs and lows that go along with long distance running. It’s gone as high as starting my own national egg toss championship and as low as pulling the plug on this whole project. But for every time I think of one reason to stop blogging, I’m reminded of a dozen reasons to keep at it. Actually, today I was given 10,000 reasons to keep at it. That’s because the Japan Tourism Agency has proposed a campaign to give away 10,000 free roundtrip tickets to Japan, so long as the ticketholders publicize their trip on blogs and social media sites. So, anybody know of something ridiculous I could enter in Japan?